This quote has always reminded me that I have a purpose right here where I am at. When I read it I want to breathe deep and feel that all is well and that my life is happening as it should. Lately though, it seems that finding the balance has become complicated. Over the last month the actual word “balance” keeps presenting itself—balanced budget, balanced tires, balanced family life, balanced work life, balanced hormones, balanced homework with extra-curricular, balanced checkbook, and then this picture showed up on the ONE facebook page…………things did not seem to be in balance!! If I am to be truthful it all started to feel quite overwhelming. As moms we feel the pressure to balance it ALL! We want to be super moms, wives, employees, volunteers, and world changers. As I looked at the picture above I realized that I was feeling the pressure to feed the billion hungry people. 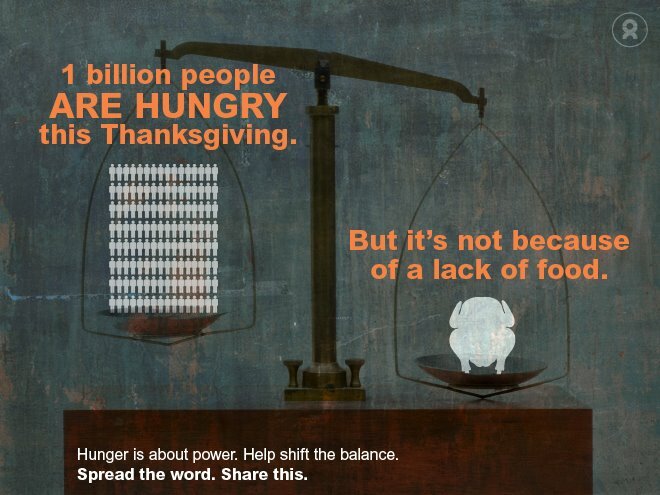 What I realized was I cannot feed the billion people by myself, but as ONE mom I can share this picture and spread the word. My visit with Congressman McIntyre in Washington D.C. helped me understand just how important it is that each one of us shares the picture and spreads the word. He was impressed with the number of letters I was bringing from ONE members in his district. He said that hearing from constituents about their wishes for protecting the less than 1% of the budget that is saving lives is important and appreciated. He has visited many countries in Africa and understands the importance of these programs. This year has been exciting for sure, but it has not come without some adjustments. As the year comes to an end I have found myself turning inward and reflecting. Thanks to my wonderful ONE mom friend, Karen Walrond, I am enrolled in her online pathfinder course and have discovered my word for the year is—you guessed it—BALANCE! I recommend everyone to check out the course http://www.chookooloonks.com/. Life is not easy and as moms we tend to focus on helping all of those around us. Sometimes we have to stop and rediscover ourselves.